The all-new Ford Focus goes on sale in the UK in March, with a two-model line-up of a sporty five-door hatchback and a stylish five-door estate. Prices will start at £15,995 for what is essentially the third generation of the Focus which Ford says will offer the the highest standards of quality, outstanding fuel economy and great handling. With over 1.4 million examples sold in Britain since its launch in 1998, the Ford Focus has become a favourite for its outstanding value, comfort and safety, and above all, for being fun to drive. In addition to the highly efficient petrol and diesel engines, the new Focus range incorporates other features from the Ford ECOnetic Technologies programme to help minimise fuel consumption and CO2 emissions. The Focus is the first Ford model to have Auto-Start-Stop technology across a significant part of the range. All vehicles with the 1.6-litre Ford EcoBoost petrol engine and the 1.6-litre TDCi diesel engine are equipped with Auto-Start-Stop, with CO2 emissions starting at just 109g/km on the diesel model. 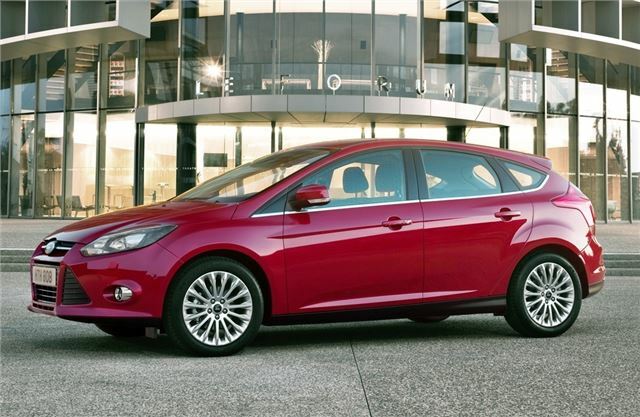 The Focus bodystyles share a sporty and dynamic character, marking the next evolution of Ford's acclaimed kinetic design form language, which has contributed to the growing popularity of the company's latest small and medium cars. At 1,484mm high (on 17-inch wheels), 4,358mm long and 1,823mm wide (without mirrors), the new five-Door model is 16mm lower, 21mm longer and 16mm narrower than the current Focus. Its wheelbase is 8mm longer at 2,648mm. The dynamic quality of the exterior is reinforced by the distinctive design of the interior. The new Focus has a modern, cockpit-style interior incorporating Ford's latest generation Human Machine Interface (HMI) system with twin five-way toggle switches on the steering wheel controlling the two main vehicle displays located in the instrument cluster and high in the centre of the instrument panel.